What Is the Difference Between Cake Flour & All-Purpose Flour? 1 What Is the Difference Between Cake Flour & All-Purpose Flour? 3 Can I Freeze Wheat Berries? Choosing the grain that fits your breadmaking goals is as important as the grinding process itself. The grinding process is the same for wheat berries, which produce all-purpose bread and pastry flour, as it is for rice, legumes and other non-wheat grains. Grinding techniques differ with nut flours, though, because of their fat content. Obtain pearled or hulled grains, which have their bran removed. Grain mills, coffee grinders and high-speed blenders all work for grinding. You can grind any wheat berry into flour. Hard red wheat berries have high protein and gluten, and work best in heavy, dense breads. Soft white berries contain relatively low gluten and make a tender crust that supports pastries, flaky biscuits and light bread. Hard white wheat berries hold the middle ground in protein and gluten content, and make an all-purpose flour that works for both soft, tender breads and firm, hearty breads. 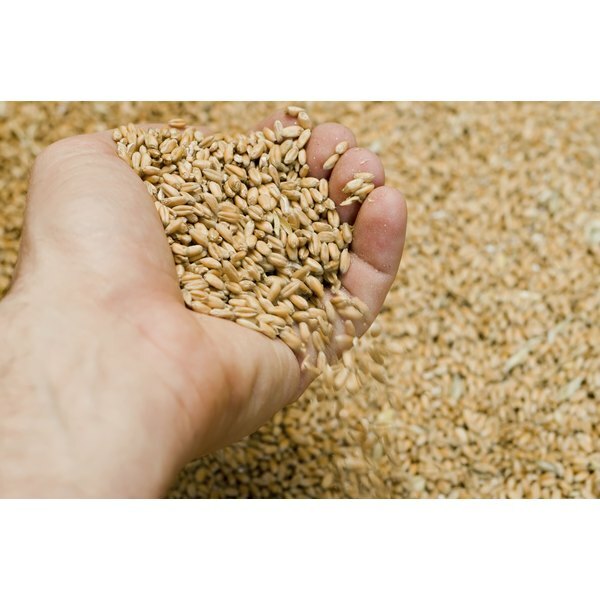 Non-wheat grains include rye, spelt, barley, heritage, einkorn and kamut. Kamut is one of the oldest known flour grains. It has high protein and low gluten, and works in pastries and pasta. Heritage and einkorn are both considered ancient wheat blends and make flours that develop a hearty crust. These grains are best interpreted in artisanal, rustic breads and pizza dough. Spelt, oats, rye and barley are early grains but aren't considered ancient like kamut. Spelt and barley have a characteristic nuttiness that works in specialty breads. Gluten-free flours used in breadmaking include rice, oats, legumes and seeds. You can turn any seed, nut, legume or rice into a flour, but some types are easier to grind and use in breadmaking. Buckwheat, white rice, lentils and sunflower seeds are the best bread-flour candidates, and you can grind them in a coffee grinder. You need to remove as much moisture as you can from grain before grinding. You can use a dehydrator for small-batch drying, but an oven works best if you need more than 3 or 4 cups of flour. Dry the grains on a sheet pan in an oven set to warm for at least 36 hours. You don't have to worry about over-drying grains, so if you live in a humid area, dry them for 48 hours or longer. Grind the grains in a coffee grinder to a fine powder or for about 60 seconds. Sift the flour through a sieve and regrind the pieces that didn't make it through. Nuts require a different grinding technique to grains and seeds. Almonds, hazelnuts and pecans make the best bread-flour components. Cashews, pistachios and chestnuts are used in small-batch specialty flours. Soak the nuts in water for 24 hours and drain them. Grind the nuts in a food processor until coarse and drain them in a muslin bag; wring the water from the nuts and reserve it for drinking or bread read recipes. Dry the nuts in a warm oven for until they crumble easily, 24 to 48 hours, then grind them in a coffee grinder to a fine powder.